Disclosure: This post is sponsored by Workman Publishing. All opinions are my own. I keep asking myself where did the summer go? It seems like just last week that my oldest daughter, Olivia, graduated high school and my youngest, Bridget, wrapped up grade six. School starts here after Labour day weekend and it’s approaching too fast for my taste! I’m starting now to prepare for the hectic back to school season. Bridget is going into grade 7 which is often referred to as “middle school” or in our area, we call it “junior high”. It’s my job to make sure she’s ready and excited to have a productive, successful and fun year. She’s looking forward to going back to see all her friends and to find out who her teacher will be this school year. Besides the usual stuff like paper, pens and clothing, I’ve shared something new with Bridget this year and she’s really enjoying them. 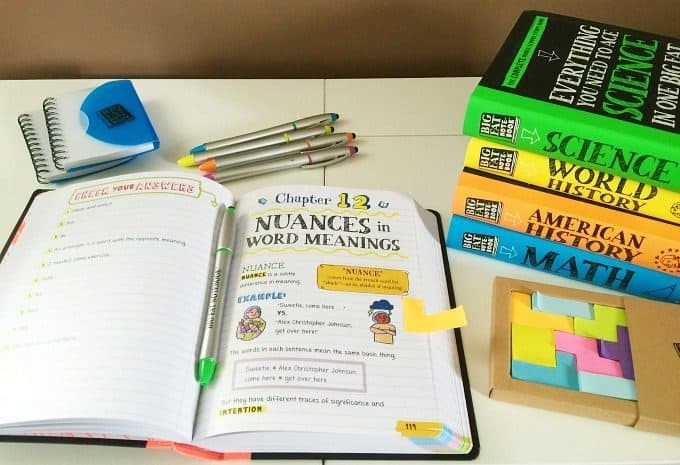 Meet the Big Fat Notebooks, a revolutionary study guide series designed just for middle school students by the makers of Brain Quest. I told Bridget to think of them as getting notes from the smartest kid in her class. I admit that I even spent some time reading them too. My knowledge of American History isn’t the best so I learned a bunch of fun facts. My friends better watch out the next time we play Trivial Pursuit! 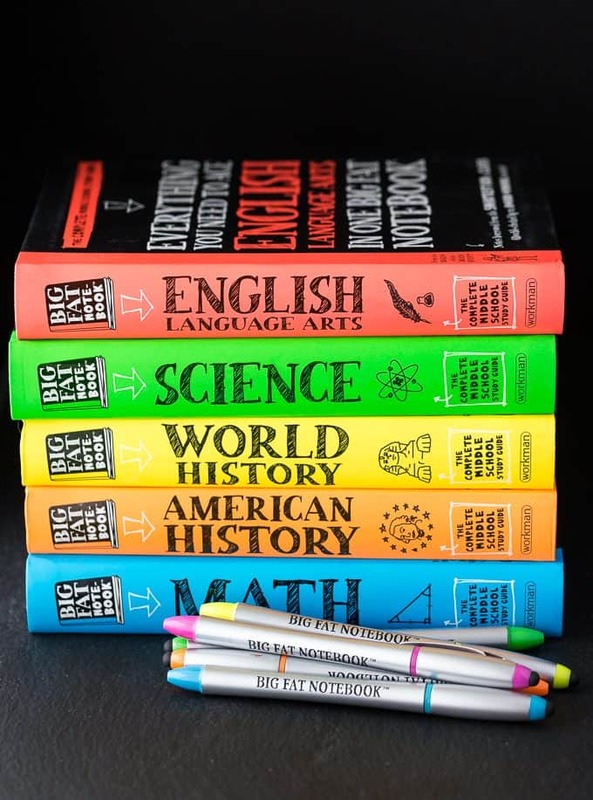 The Big Fat Notebook series has five books – one for each subject typically taught in middle school like Math, Science, American History, English Language Arts and World History. Everything You Need to Ace Math. Think fractions, decimals, how to multiply and divide them, ratios, proportions and percentages, geometry, statistics, probability, expression, equations and the coordinate plane and functions. Everything You Need to Ace Science. Takes readers from scientific investigation and the engineering design process to the Periodic Table, forces and motion, forms of energy, outer space and the solar system to earth sciences, biology, body systems, ecology and more. Everything You Need to Ace American History. Covers everything from Native Americans to the war in Iraq with units on Colonial America, the Revolutionary War and the founding of a new nation. It also looks at Jefferson and the expansion west, the Civil War and Reconstruction, World Wars, the Depression, the Civil Rights movement and more. Everything You Need to Ace World History. Begins with the Paleolithic Era and visits several ancient civilizations like Egypt, Greece, India, China, Africa and Rome. It also follows the middle ages across the world, the Renaissance, the age of exploration and colonization, revolution and imperialism and the modern world and the wars and movements that shaped it. Everything You Need to Ace English Language Arts. Discover everything you need to get you the best marks with important topics like grammar, including parts of speech, active and passive verbs, Greek and Latin roots and affixes, nuances in word meanings, textual analysis, authorship, structure and other skills for reading fiction and nonfiction, writing arguments, informative texts and narratives. As you can see these notebooks are packed FULL of valuable info! Bridget needs an extra little push in math as it’s not her strongest subject. I try and help her, but will admit that I’m lost too! This notebook makes the concepts easier to grasp for both her and myself! She says her favourite one is English Language Arts. I guess the apple doesn’t fall far from the tree because it was always my favourite subject too! She asked if she had to follow the books in order or if she could jump ahead to parts she wanted to learn about. I told her to use them in whatever way works for her. 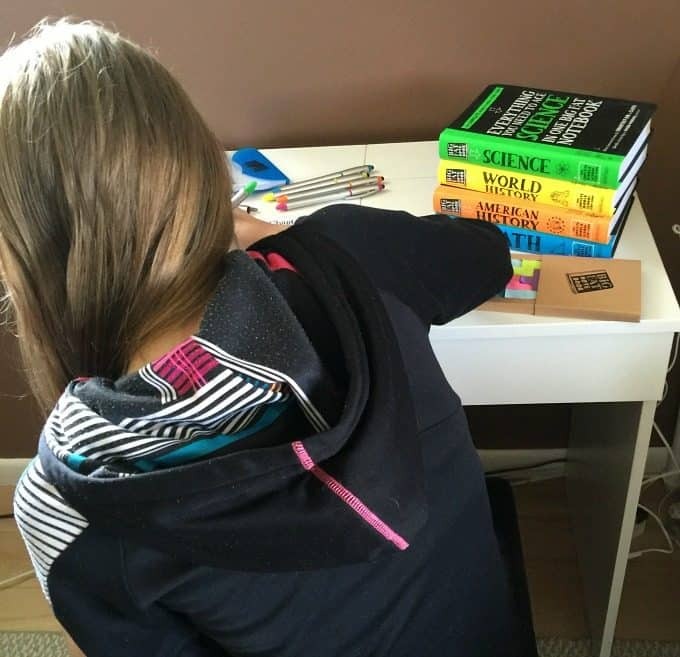 One of the big reasons why these notebooks are such a hit with students, my daughter included, is the way the information is presented. It’s laid out in a fun, easy to read and understand format with lots of colours and doodles. When there is a definition of a word or concept, it’s explained in a way that makes sense. Visual learners will appreciate the graphics of the trickier concepts. There’s also mnemonics for easier recall of concepts and quizzes with an answer key to check your work. I can see these notebooks helping a lot of students! 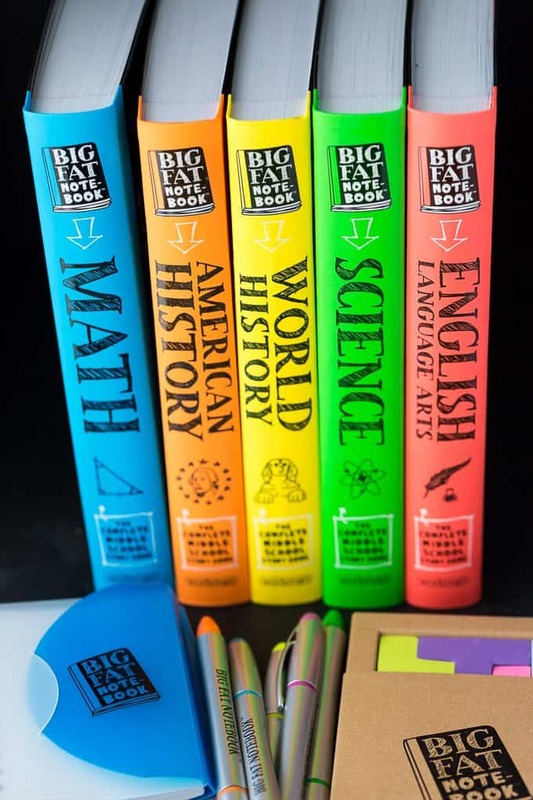 The Big Fat Notebooks meet Common Core State Standards, Next Generation Science Standards, state history standards and are vetted by National and State Teacher of the Year Award-winning teachers. What this means to me is that the info inside is valuable knowledge from trusted sources. 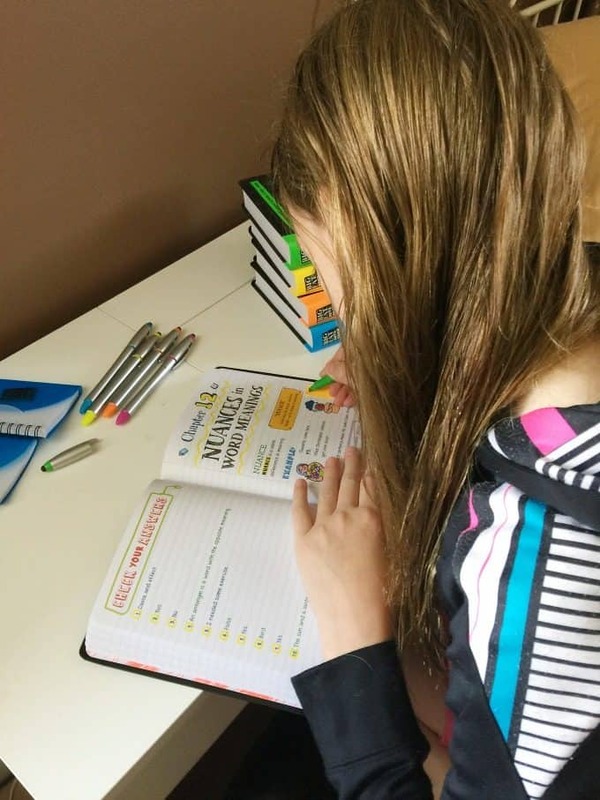 If you have a middle schooler, pick up the Big Fat Notebooks for your child to get a head start on the school year coming up. You can purchase Big Fat Notebooks on Amazon, Barnes & Noble, Indiebound and Workman. What is your favourite feature of the Big Fat Notebooks? 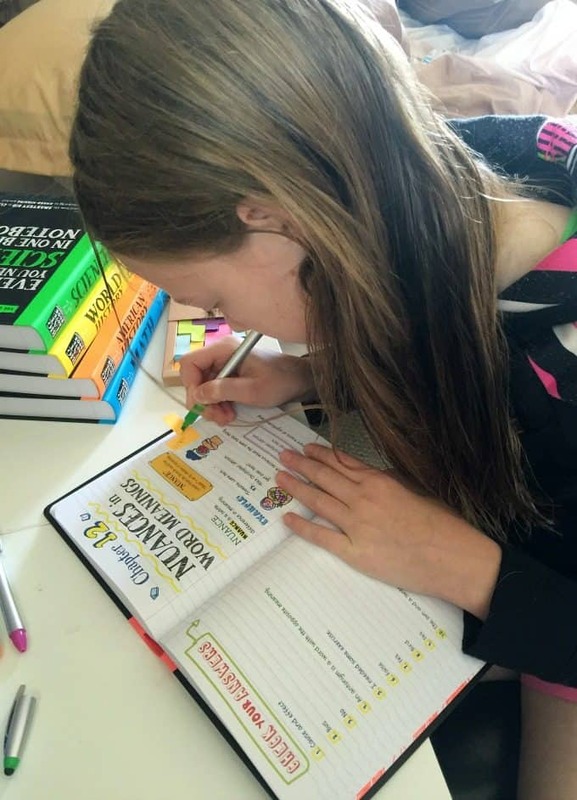 I love that these books give kids some great ideas about how to take effective notes! I really like that these books guide children through taking effective notes, it’s a very important skill that they’ll need all throughout their schooling. I love the colors and the different ways it teaches the concepts to help my kids learn different subjects that sometimes are glossed over. I like that it is a cool study guide. I love how colorful the book cover and pages are and that they are in each main subject. I could see my students loving these books! I love that th ebooks have everything you need to know about that subject! I like that they cover so many important topics. I love the designs of the notebook because it draw attention to the subject matter for each one. Everything that they need is right there. easy to read. The BIG FAT NOTEBOOK series is built on a simple and irresistible conceit—borrowing the notes from the smartest kid in class. They sure would help out. I like that – They make learning fun and are the perfect next step for every kid who grew up on Brain Quest. I like how creative they look. I love how creative they are and makes learning so much more interesting. I love that one book covers everything you want to know on a topic. No need to go out and buy a carload of books. I love that they are fun and not typical school books! Plus everything is at their fingertips to learn! I like that critical ideas are highlighted in neon colors. I like how they make learning fun! I like the topics that they cover! I commented on the Spicy Sausage Soup Recipe post.